When using the command line to set channels you can now directly reference groups and palettes (Groups can be used both sides of the @ command). 1/5 @ Wide Zoom - Channels 1 though to 5 will apply the palette "Wide Zoom" (group or palette). Front Wash @ Red - Group "Front Wash" will be set to the palette "Red"
Front Wash @ position DSC - Group "Front Wash" will be set to group "position DSC"
Export and Import option have been added to the timecode triggers window to make editing large trigger sets easier. Each timecode trigger now supports directly calling a Lightfactory command. The command can be any supported by the main command line interface. When using the pan and tilt fan options a new check box will apply the changes relative to the fixtures position when the fan window is opened. 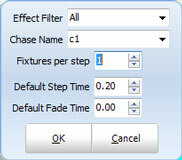 When setting up simple chase effects you can now specify a default time for channels that are fading out. If no out time is set then the channels will fade out in the default timing that is set. 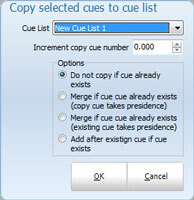 Any number of cues can be copied to another cue list using this new option in the cue list editor. 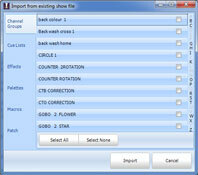 When copying cues you can select to move the cues to higher cue numbers using the "Increment copy cue number" option. 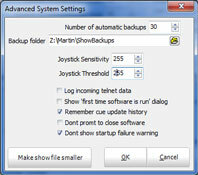 Additional options allow you to set how the software deals with conflicts. If full tracking is being used then an option check box will be displayed to select if LightFactory will copy just the channels in the cue or copy the entire tracked state of the cue. 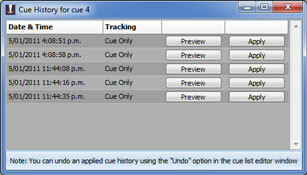 The cue update history is a powerful system to make sure you never loose a change made to your cue list. Every time a cue is recorded or updated the entire state is time stamped and stored in the cue history table. At any time you can open the cue history (from the cue options menu in the cue list editor window) and preview or apply a previous update. As an enhancement to the existing automatic backup system LightFactory can new specify the backup folder meaning that any remote drive can be selected for more secure backups. The advanced options also allow for the number of automatic backs to be set. LightFactory can now pull parts of other shows into the current show file using the new import feature. This system will allow you to import channel groups, cue lists, effects, palettes, macros and patch information from any existing LightFactory show file. If a naming conflict is found then data will be automatically renamed before being imported to ensure no conflicts occur. When using the "Create a simple chase from selected fixtures" option you can now specify how many fixtures to include in each step. Two new reports have been added to the cue list window to help identify what is being used in various cues. The "Channels in cues" report will show you what cues use specific channels and the "Palettes and groups in cues" report will show what cues reference palettes. The new reports can be found in the "Options" menu in the cue list editor window. Switching between 4Up mode and normal mode can now be remembered for each shortcut page. 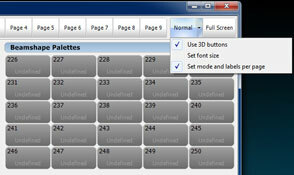 This is options by selecting the "Set mode and labels per page" option from the menu as shown above. By default the mode will change all pages as it does now. When this option is enabled the header text in the 4 sections will also be remembered per page. This means that you can change a header independent of other pages. When setting up a simple chase the output values can now be set to "Random" for dynamic effects. The software will generate the output value at the time of running the effect as a random value. Random values can be created in the cue channel detail window by entering "R" in place of a value. If a value is entered after the "R" it will be used as the maximum value for each randomly generated value. In the above example the user has entered "r 5.6" in the time field after selecting the time column of values. This will populate all of the selected time values with a random value between 0 and 5.6 seconds. In the second example the DMX values are set to random values between 0 and 120 by entering "R 120" in the first field. To help with organising your show the cue playbacks can now be moved as easily as the effect playbacks. Right click on the left of the playback and select the "Move" option, then click on the playback number you want to move it to. 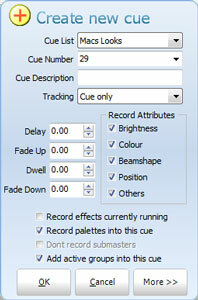 A new option when recording cues can be used to add active groups into the cue as groups rather than channels. If the group is active at the time of recording the cue then the channels in that group will not be added to the cue but the entire group will be added at the level currently set. When this option is enabled then the "Don't record submasters" option will be disabled. Version 2.6 introduces a new type of effect to the system. The "DMX Recorder" can be used to do a real time recording of the DMX input stream for playback at a later date. The recorded DMX stream will be stored with the show file and can be played back like any other effect either on the fly or inside of cue lists. There is no limit to the number of streams that can be recorded and playback can be directed to any DMX universe. When playing back this type of effect only the DMX channels that change will be applied allowing the effect to work along side of other channel control. When recording the DMX stream you can choose to append the new data to an existing recording or start clean. CueServer is a lighting control solution for of stand-alone architectural and show control. LightFactory is now able to directly integrate with these by exporting a cue list directly to the device. A simple interface will allow you to select the cue list you want to upload and the actions you want for each of the buttons. LightFactory will then take care of creating the necessary resources containing your show data and upload it in one operation.